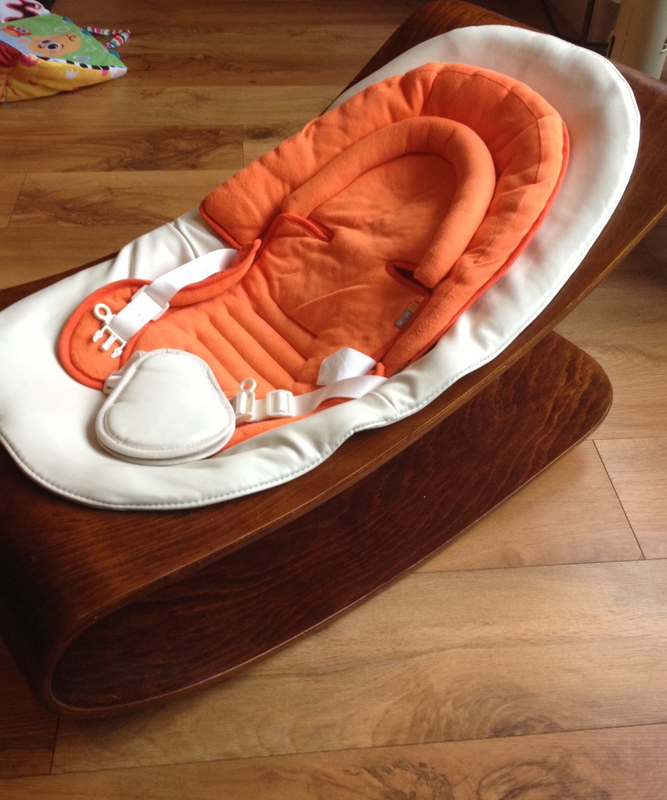 We got this gorgeous Bloom Coco baby chair for our beautiful first born. She used it every day and it was still in pristine condition for Baby who loves surveying the world from it. We were bought a BabyBjorn Baby Sitter Balance Chair too which is fabulous but the Bloom Coco, well, it is a work of art. My number 1 best baby buy is this Bright Sparks Coorie pouch sling. It is probably the least stylish recommendation I have ever made but boy, it does it’s job well. For long days out the sturdier Baby Ergo Carrier is better but for around the house and short walks the Coorie pouch is brilliant. It isn’t at all bulky and is literally just a one piece fleece pouch that you slip on over your head, pop baby in and that’s it. It means you have both hands free to cook, read, play, carry things to another room, dance. As my baby has got bigger she likes to stick her head out and have a look around. I am never without mine. Like most people, I love the Jelly Cat range of soft toys and my kids have their fair share of them. Baby likes to sleep with her favourite balanced on her head. For a different take on the cuddly toy you can’t beat this from Elodie Details. The pattern is so pretty and my Baby loves looking and grasping at it. 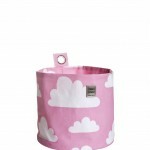 I love this beautiful Farg & Form cloud print and these hanging storage containers are very useful too. While I can still decide what goes into my baby’s room I am filling it with beautiful things. 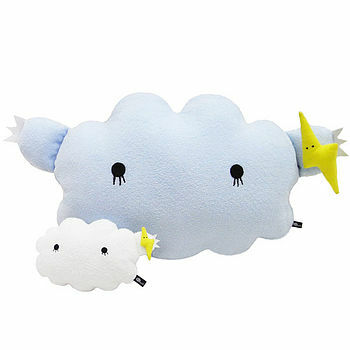 I used this Noodoll cloud cushion as a breast feeding pillow when she was a newborn. It’s super soft and would make a lovely, different baby gift. Sticking with the cloud theme, this cloud and moon mobile is simply stunning. My eldest had a play gym she really liked but it was not pleasant to look at. This Lamaze Play Gym on the other hand looks lovely and Baby adores it. It folds up easily too and doesn’t take up much space. 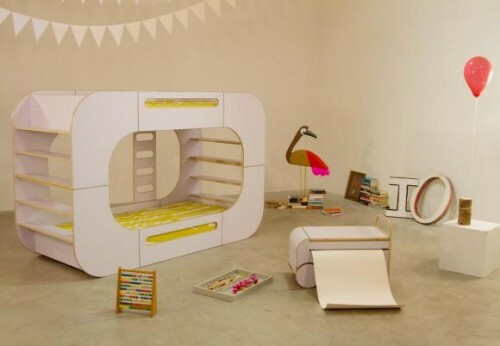 I like kids’ things that are beautifully designed and have my eye on this bed for my eldest. If she doesn’t like it, I might get it for my room! My best friend is having her baby early in the New Year and I am on the look out for beautiful and useful presents. Any must have baby buys? 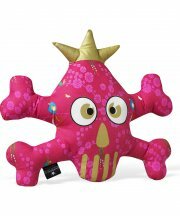 Great recommendations for baby gifts? This entry was posted in Baby Bjorn, Bloom, Bright Sparks, Children, Elodie Detail, Farg & Form, IO Kids Design, Jelly Cat, Lamaze, littlenestbox, Noodoll on October 21, 2012 by Eve WornOut. Ooops, I did it again. Ventured out on Thursday wearing pretty much head-to-toe Zara. Exceptions were the black faux fur jacket from H&M, the New Look boots and the lovely knitty scarf my mum made for me years and years ago. But the basic outfit – a faux leather front knit and camo trousers was a little contribution to Amancio Ortega’s position as the third richest person in the world. I spent the day in town at the offices of a client and, with my husband working from home that day (the scaffolding for our loft conversion was being erected … eeeek) had no need to race back for school and nursery pick ups. So at 6pm I ventured out into the darkening evening with every intention of heading for Cos, thoughts of a smartish, tapered-ish black wool trouser on my mind. But then I fell into the Bermuda Triangle of the brand new Primark at Tottenham Court Rd. It was supposed to be an in and out job, truly it was. But my goodness, that store is, compared to every other Primark I’ve ever visited, a revelation. Still new enough to be well laid out and glossy, the changing rooms large and uncrowded, the staff friendly and polite. I won’t say how long or how much I spent in there. Suffice to say that my text to my husband, as I journeyed home, said simply “Oh dear.” And also, some of it will probably go back. 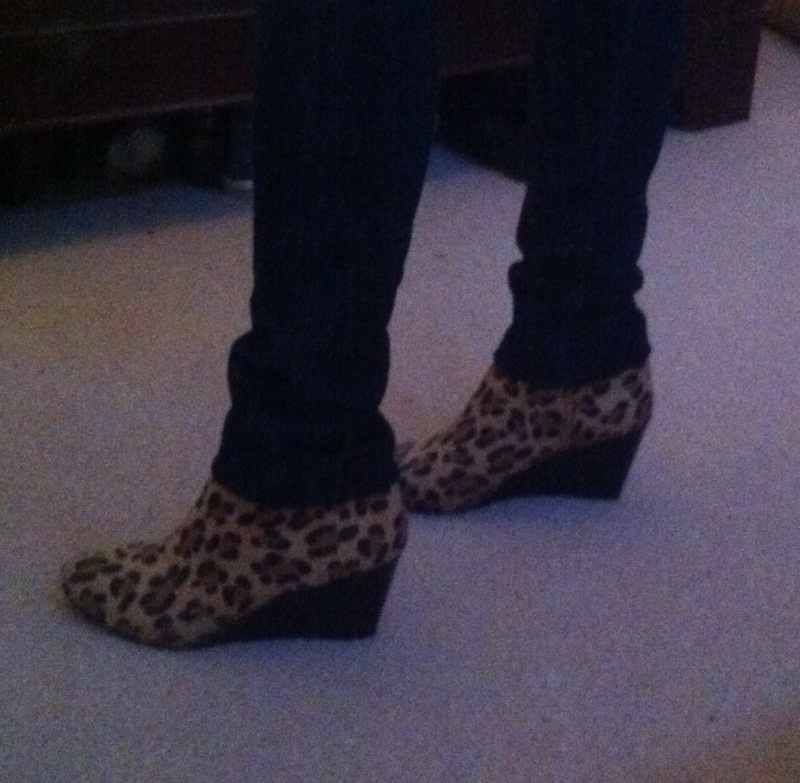 But these wedge ankle boots won’t. Every once in a while, you come across a shoe so completely unnecessary that you just have to have it. This was that shoe, last week. And lawks, they are so comfy! I wore them all day on Friday, including on the school run, hanging out with my youngest all day and then having friends over for dinner that night. They won’t last, but they don’t need to. For now, they make me smile. And yes, I should have hitched up my Goldsign jeans before I took this photo! On Saturday night, we headed out to – get this – a club. Good grief. I wasn’t worried about feeling old or whatever – didn’t occur to me until one of my friends from home suggested that I would most certainly feel it – but I was worried about the noise levels. I’ve never been good with noise and having children has certainly not increased by ability to manage it. Once they go to bed, blessed silence reigns. I suspect it’s why I am such a fan of social media – it allows me to talk without hearing. Second on my list of concerns was what to wear. In the end I opted for a pleather studded mini I’d picked up in my Primark spree. It was £10, reduced from £22 and I have to say, the quality of the pleather is amazingly decent – quite heavy and soft. I’ve taken an extra pic of it because the first doesn’t really show the studs, which aren’t too over the top, as these things go. I wore it with black tights from Tiger (they are fleece lined and soooo cosy – hark at me, cosy, can’t you just tell how suited I am to a club night??!!) and The Shoe of Hotness from Zara, plus a black sweater with a black sequin stripe through it, which I didn’t manage to take a decent photo of. The sweater played it all down a bit I think, so I felt much more in my comfort zone – until that is, the music was pumping, conversation for Ol’ Ms Hard-of-Hearing here was off the cards and I was dancing away bang in front of the DJ box. Then the sweater came off. Wa-hoo. This entry was posted in Outfits on October 21, 2012 by Sarah WornOut. 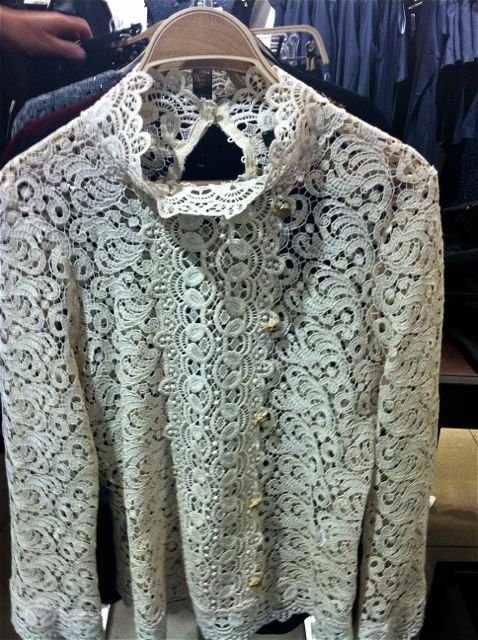 Zara in non-polyester blouse shock! 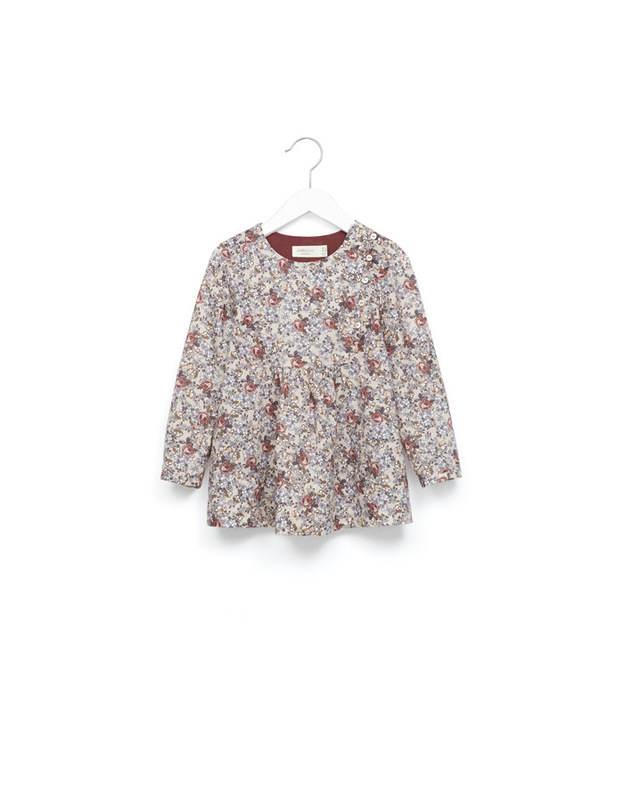 I actually found a blouse in Zara that is made from natural fibres!! Very Marant, I think. Of course I can’t find it online now but I’ll keep an eye out for it. I really love the classic style of their little boys and girls ranges, just looking at those outfits is enough to make me broody. Today I’m taking my daughter and her lovely friend to the cinema. After one to many awful childrens’ films I have it sussed, I only frequent one particular cinema where I can access the internet. Bad mummy! 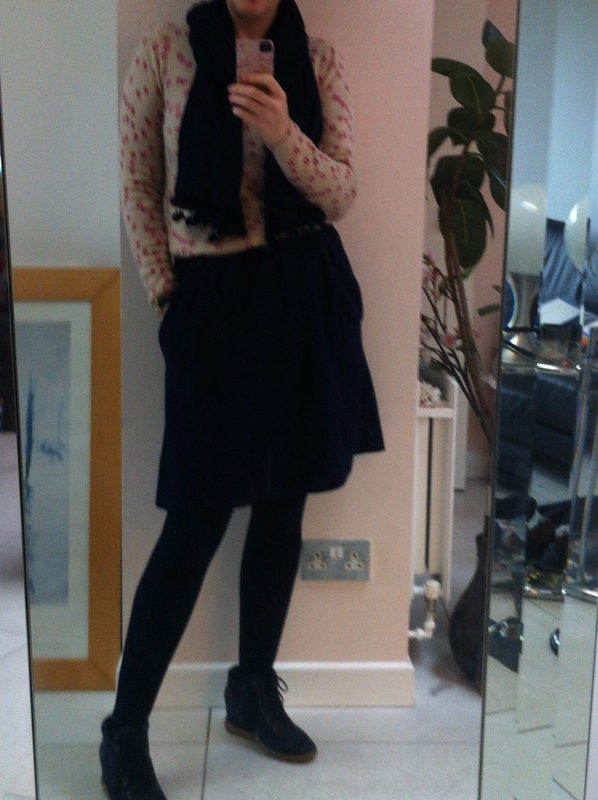 I’m wearing a Clements Ribiero cashmere jumper, homemade skirt, Zara jersey scarf to which I attached bobble trim, and Aldo wedge trainers. Let’s hope that Hotel Transylvania isn’t as bad as Top Cat! 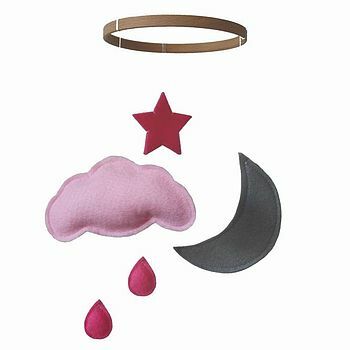 This entry was posted in Children, Lust List, Outfits and tagged Aldo, Clements Ribiero, Isabel Marant, Zara on October 21, 2012 by Emma WornOut. Not quite sure why but the name ‘glossy box’ always makes me chuckle. But I digress. It’s been an ‘interesting’ week chez Gina. Health ups and downs (happily now on the way up) and my eyes are still a nasty red mess (though yesterday they tricked me into thinking they were getting better). I’m googling like a madwoman and my current ‘fix’ of choice is two teabags morning and night placed on the eyelids. It is helping a ‘bit’…certainly more than all the awful drops and potions the drs prescribed. Anyway – I MUST STOP moaning about my eyes. But in honesty – I did moan to give you a flavour of my mopey miserable mood and that’s why I was so cheered to get two special parcels this week. First two gorgeous books (super sticker and colouring in) arrived to cheer up my poorly little girl. The lovely Sarah Wornout sent them as a lovely surprise. And they really worked. It took her mind off her tonsil woes for a lovely long time as she coloured and stuck. So thank you Sarah! 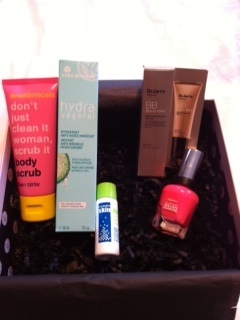 And I got my latest Glossy Box. Now of course it’s not quite as nice a surprise when you’ve actually paid for it yourself 😉 but this really was a bumper one. No boring fillers or ‘not quite right’ bits. I did a post explaining how the glossy box system works a while back, but in a nutshell – you pay a monthly fee and you get a box of products every month. Some sample size, some gorgeously generous full size. When you sign up you do have to fill out a section where you specify your skin type and requirements. I would suggest not ticking the ‘perfume’ box otherwise you’ll get perfume samples…which, lets face it, are in plentiful supply at any department store! So this month I got some pretty hefty samples. Dr Jart BB cream – which I’ve been desperate to try (though I love love love the Bobbi Brown one so that may be hard to beat!). A full size Sally Hansen ‘complete salon manicure’ a nail colour that claims to have base coat, strengthener, growth treatment, colour & top coat all in one. Fab time saver if it’s any good. I shall report back. Yves Rocher instant anti wrinkle moisuriser – I’m waiting till my stupid eyes calm down before I test any new creams but this one sounds fabulous and it’s got the magic Hyraluronic Acid which is a bit of a wonder ingredient. An anatomicals body scub which looks very promising and finally a full size skinetica anti-blemish which promises to quickly clear spots with no side effects…bloody marvelous. Quite astonishingly I don’t currently have any spots to test this on but I’m sure I will soon enough and will let you know how it works. So – lots of lovely products for me to try and this month’s box is worth a lot more than the £10 (plus P&P) that i pay so I’m very chuffed to bits. If you want to give it a try then all the details and info are on their site here. This entry was posted in Uncategorized on October 21, 2012 by Gina WornOut. Today’s been an action packed day. Took Baby swimming for the first time early this morning before heading into central London to a demonstration followed by an early dinner. I’m exhausted. Wore Aldo Boeken boots, Zara black skinny jeans, black Gap slouchy roll neck and black Zara leather jacket with black Marc by Marc Jacobs Francesca. I don’t think the jeans work with the boots. I would’ve worn my favourite blue Zara slim jeans which are longer but they ripped along the pocket yesterday and are beyond repair. I’m not entirely impressed with how the Gap slouchy roll neck has washed either but I didn’t realise that until it was too late. This entry was posted in Aldo, Gap, Marc by Marc Jacobs, Outfits, Zara on October 20, 2012 by Eve WornOut.